... so here one is. Luis has been doing a lot of work lately on the mountain and especially the stuff at the top. Other folks have been doing a bunch of work on things that are not as obvious in this picture! “Progress! Yes, I’m making progress!” – Gune, Titan A.E. 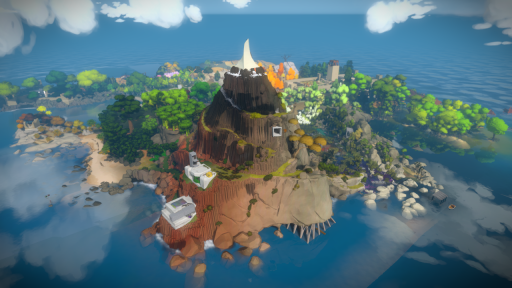 Or a cynical take on things – you’ll solve puzzles until you get stuck, and then you’ll alt-tab and google “the witness walkthru” and then you’ll “solve” the rest of the puzzles rapidly in short order. The fun is in the struggle to figure out the harder puzzles. Also, if you do get well and truly stuck then you can just go try out another of the island’s sections. You won’t need to complete every puzzle or even every section to ‘beat’ the game. Also, by stepping away from the first puzzle for a while, I’d be willing to bet that you could come back later with a fresh perspective and solve it with relative ease. The new mountain look… wierd. I must say I like more the prevoius iteration. Like now it resembles a cake. Yeah, the mountain looks like it’s wearing a shark party hat. It’s silly. Looking awesome! Keep up the stellar work guys, it looks like it’s coming along! I’m likin’ the rust colors, and I’m now immensely curious to know what’s going on at the top of that mountain. Is the building still there? Is there more to that peak than just a hill of snow? It’s great work you guys are doing. 595 Puzzles….? Woah. That actually sounds daunting. Wow-wee. Everything continues to be significantly developed. Exciting that we might see it mid-2014, but if another few months means another several cycles of this kind of iteration and polish, I would be happy to wait. I must say, I too preferred the previous iterations of the mountain. It looks too regular, too symmetrical as if you know it’s been artificially created. The strange swirl at the top (architectural element?) is equally disturbing. Comparing to what seems to be the inspiration for this mountain, the Devil’s Tower, my guess is that the “man-made” feeling I get from it’s virtual counterpart, is the way in emerges from the ground. Anyway, I guess it’s been a lot of hard work to get there and we might never have this perspective from within the game so well… perhaps it’s all for the best, after all. Man, just flipping between this snapshot and the last one it seems like there’s changes everywhere you look on the island. Getting really excited! Merry Christmas Jon & Team! Island looks great! I take a look at this blog from time to time and I can´t wait to see the game released. It looks like a really interesting piece of work from so many views and levels, but we have to wait to know for sure if is as good as it looks! This blog takes a technical point of view usually except when you talk about premiers and other kind of events, which is cool and interesting even if you are not involved in the world of computers and programing. But every time I take a look at it I wonder if someone at some point could talk about other aspects of the game. I know you don´t want to talk much about even the mechanics because you are trying to avoid spoiling the experience, but maybe you can talk about some other layers or views of the game besides the more technical ones without doing that. I read somewhere for example that there is a connection between The Witness and the Philosophy (for lack of a better expression) of Ramana Maharshi, that of Advaita Vedanta. You even took the name of the game from an expression familiar with the sage and with the Philosophy (Nisargadatta Maharaj and Atmananda Krishna Menon used it very often as well). Personally I find this really interesting. I see perhaps another connection with a very interesting book written by Argentinian writer Bioy Casares, “The Invention of Morel” which takes place on an inhabited island. The works and lectures of Bryan Moriarty too… I don´t know, I guess is a whole range of sources of inspiration and things to look at when you are doing such an interesting (and big) work as The Witness. I would really appreciate if at some point someone could talk about this other stuff. I know your priority is finishing the game, no doubt, but maybe someone can find some day a little time to write from perspectives other than the more technical ones. Congratulations anyway for the work and for the blog, and Happy New Year! He has talked about the puzzles in interviews. Not much on the blog, however. I’m so excited for his game to be released! He’s obviously very busy at the moment, but I’m wondering if anyone knows if he still does any consulting? I’ve been working like mad on my game and would pay anything! (within what I can afford :) to hear his input! If the person moderating this blog could email me with an answer, that would be wonderful and so appreciated! Happy New Year to All ! And a big thank you to Jonathan Blow, for his continued leadership, spokesmanship and inspiration to those interested in beneficial, positive game design. The future of games is looking brighter because of you! I’ve been watching some of JB’s interviews, and honestly. . . His idea of making a game that involves that “click in a person’s head” is spot on to what I’ve been trying to do myself. When I first began reading the philosophy of Plato, I learned how to speculate on my own existence as a human. There was no dogma to TELL ME, how I should feel. Thus, what JB has been saying all along is that, he is going to pose a question, but you must find the answer yourself. The question is the puzzle, it can simply be something such as “What color is the house”, rather than tell you, it’s important that you discover on your own. In this way, the feeling is more genuine and the person has a sense of discovery and accomplishment. Irrelevant to this particular post, but nonetheless important to state, because this game is built on the notion of self-discovery. For that, I am anticipating it’s release, with that in mind, I may actually purchase a PS4 just for this reason. It’s looks like some kinda VR support but I can’t see it being Oculus Rift for PS4, because the creator Palmer Luckey pretty much said Oculus Rift for consoles isn’t possible. So either this is for the PC release of The Witness, since it is only a timed exclusive on the PS4 or Sony are making there own VR headset which is likely. With CES 2014 starting in a day or so, we’ll probably find out if Sony is making their own VR. Or a possible side by side comparison of PS4 and Xbox One/PC. The only reason I ask is because I no longer have bootcamp installed due to space reasons, but you can bet I’ll be purchasing this game! Here’s a much longer answer than you probably wanted: we’ve at least considered nearly every platform currently out there, and the ports definitely fall into “hard” and “easy” categories. By “hard”, I really mean time consuming. That’s due to a big delta in performance, or a big change in actual hardware architecture (and often therefore APIs). Jon’s mentioned this before but as a tiny team we have to be very careful deciding to do any of these. So far iOS is our one foray into this bunch. Obviously those are just the technical considerations, Jon will be the one to decide where we go. We definitely want to reach as many players as possible though. Wonderful! Thank you. Glad to hear it. I am not one to ever comment on anything, but I thought that I should say that the game you guys are developing just looks amazing! I do not want to wait another day to play this, but I will be patient. I know that the wait will be worth it. Damn, where are more updates on this game? How much of it is done and how much is left? What are they doing now? I’m really looking forward to playing this game. I know. I’m waiting for a new update too, but they are obviously getting close to finishing and so less updates is kind of a good thing at this point to finally launch the game. Look at 2 posts above. The designing phase of all the areas is most likely finished, but nothing was mentioned about the story being completed. Now they are probably checking for bugs, polishing everything, dotting Is and crossing Ts. I have no idea what’s involved in working on different ports for the game too, so there’s that as well. What exactly counts as a puzzle? If there is a line with 7 panels are each of the panels seperate puzzles or counted as one entity? Thanks. And Can not wait for this game! I’d say that a line with 7 panels counts as 7 puzzles. But I’ll be gladly surprised if it’s counted as one. Anyway, looking forward to this game more than any other in 2014. Please make new update to ease the pain.